Lean diced beef is fat free as it is cut from diced skirt so it is always lean and tender. They are cut from free range organic breeds such as Aberdeen Angus, Red Pol, Dexter, Long horn, welsh black, Hereford, British white, Charolais; we buy all our beef direct from the farm. 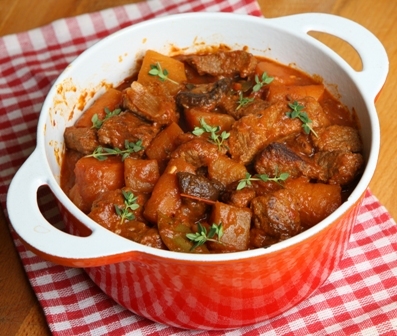 beef skirt is a perfect beef for stews and casseroles as the meat will not go dry and hard but will soften and have a beautiful texture and flavour when slow cooked. TOP TIP: Why not buy yourself a slow cooker? They are very in-expensive (under £25) and you can put your stew on in the morning and it will be ready when you get home.